in a quiet bay on Lake Owen in Cable, WI. Vacation at Otter Bay Resort and enjoy comfortable lodging & great fishing expeditions on Lake Owen in Northern Wisconsin. We welcome fisherman and families to the resort and to Lake Owen. The lake is renown for its crystal clear waters, abundant with walleye, small & large mouth bass, northern, crappie, perch and bluegill. Lake Owen stretches for nine miles through scenic rolling hills and towering pines. It is rated among the best fishing waters in the state of Wisconsin. Become adventurous, take a boating (view boat rental info below) excursion across the lake and find a favorite local fishing spot. 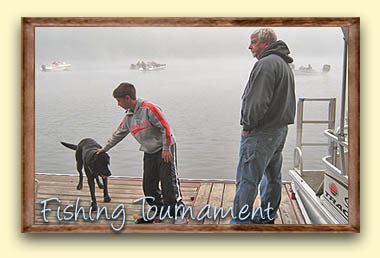 Or you may choose to just sit & relax and enjoy fishing off the docks at the resort. Along with the great fishing experience at the resort, there are other recreational activities, plus a nice sandy beach for your families enjoyment. Click here for more details & registration form. At Otter Bay Resort we have a boat landing exclusively for our guests to launch their boats and canoes. If you don't have a boat, fishing Boats, motors, canoes, & pontoons are available to rent through the Resort. Please reserve boats when making reservations. A fishing boat and motor is included with weekly cabin rentals. Life jackets, anchors and necessary safety equipment are included with boat rentals. All passenger maximum capacities and all of the rules of the U.S. Coast Guard and the Department of Natural Resources are strictly enforced. Call us for rental rates & more information. We have Fishing Boats and Motors available. You may also purchase gas, oil, or bait at the resort. Northern Wisconsin Fishing Vacations: Otter Bay Reort is a unique place with relaxing atmosphere & a spectacular location for individuals and families to enjoy fishing and have fun! All Rights Reserved Copyright Otter Bay Resort & CCS, Inc.